Everyone needs a personal Sidekix. You know, to take on trips, to bring to school, just to have along wherever you go! So, take a minute to see our new Sidekix. My daughter LOVES it. She has already taken her to Chicago with us and out to Pizza Hut for lunch! Here is our little cracked egg! Meet Click A Dee Chick A Dee! She is sooooo... cute! When you first meet her (OK she could be a he, but in our house she is a girl), she looks like a cracked egg. But...when you unzip her and pull her out and re-zip her you have a fluffy, yellow chick. There is a clip that you can attach to either the top of the egg or to the top of Click A Dee Chick A Dee's head. So convenient for taking her with you. Just clip her on your purse strap, backpack, lunchbox or belt loop. She can go anywhere! And you can play with her in so many ways. You can toss, kick, clip, carry or play with your Sidekix. Share your best secrets with your Sidekix. And each Sidekix has little magnets in their wings, paws, ummm...you know, so they can hang on a locker, or other metal object or, as my daughter kept doing, they can pray! It is Click A Dee Chick A Dee! See where she zips in the back. And... there are several Sidekix to choose from. Bamboo a Panda bear, Mojo a cute, brown, spotted puppy, Inferno, and Savannah a Zebra. There are more Sidekix in the works! Children love to discover--it is an essential trait they have for exploring our world. 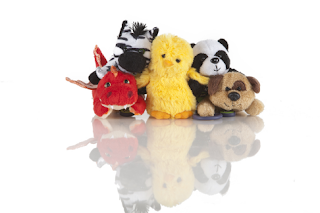 This trait led me to create Sidekix Toys, a toy that leads to the discovery of a new friend or sidekick. On the surface of these playful balls lay the clues for the sidekicks waiting to be discovered within. For instance, a cracked egg poses the question...is it a dinosaur, turtle, or perhaps a chick? The answer lies within the toy ball. Once they have discovered their Sidekix, they can take it with them wherever they go. The unique clip allows it to be attached to bags, belts, and keychains. In addition, magnets placed inside the Sidekix Toys allow them to cling to bikes, lockers and so much more. However, if you're looking for a fun toy, simply tuck and zip your Sidekix back into its ball form to play catch or clip it on your bag as a fun accessory to fit your personality. Here at sidekix we like to say kick'em, zip'em, flip'em, clip'em, and stick'em. There are endless possibilities for future Sidekix Toys, make sure to follow us on Facebook for contests and the chance to help us create future lines. Enjoy collecting them all! Now, you can find Sidekix on Facebook, Twitter and Pinterest! Be sure to check them out and follow, like, and pin them. Hanging on with the magnets in her wings. Just hanging around at lunch! Disclosure:I received no monetary compensation for this review. I did receive on Sidekix for review purposes. All quotes in red are taken directly from the Sidekix website. All thoughts and opinions are mine. I like the dog one! I like Inferno the dragon. I like Savannah the zebra. I like the dog the most. I like the dog and the panda, I just can't choose! My kid likes INFERNO... Even his name is awesome! Inferno the Dragon would be loved in this house! I would choose the panda! I like Bamboo the Panda the best! I like the chick the best! I like Click A Dee Chick A Dee- so cute! I like the best friends dog one! I love the best friend dog! My favorite is the Panda. The dog one, it is so cute !